The ideas here are for general party favor bags. This page won't tell you what to put in your bags, rather, it will give you ideas for types of bags and what to do with them. Visit a themed page for specific theme ideas. 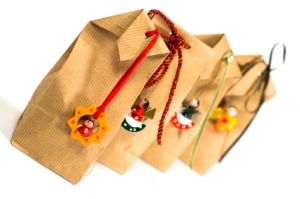 Simple brown paper sacks make great party favor bags! Add a trinket that matches your theme. Personalize your bag to the theme of your party. For kids? Try adding a few stickers of the party's theme (Elmo maybe?). For adults, add a ribbon or bow with a tag that shows the event name and date. Fill the bag with whatever goodie relates to your party. For any birthday, send your guests away with a small treat that mirrors the theme of the party. If you are turning fifty, get small golden cellophane pouches and fill them with gold chocolate coins. If you have a child who loves Thomas the Train, find bright blue paper bags and have the kids decorate them with their favorite Thomas stickers, then write their own names. Fill the bags with little candies, a sticker pack of Thomas, and even a few Dollar Store steam engines! Add embellishments such as stickers or photos to personalize your theme. Use ribbon to add flair (you can buy personalized ribbon or just choose a suitable color for your theme). Create or buy a tag with each guest's name and/or your event name and date. Hang a trinket that matches your party's theme on the ribbon holding the bag closed. Return from Party Favor Bags to Home.